Truckloads of people gradually made their way to the Kalikambadevi Temple in Mandya. Their faces were scrunched up with exhaustion as they waited for Karnataka Chief Minister HD Kumaraswamy's son Nikhil Gowda to begin the procession and file his nomination papers. Around 11.30 am, the energy levels were high in the grounds outside the temple. Musical troops drummed away while people coming in from Ramanagara, Channapattana, parts of Mandya, and Hassan, began dancing to their tunes. 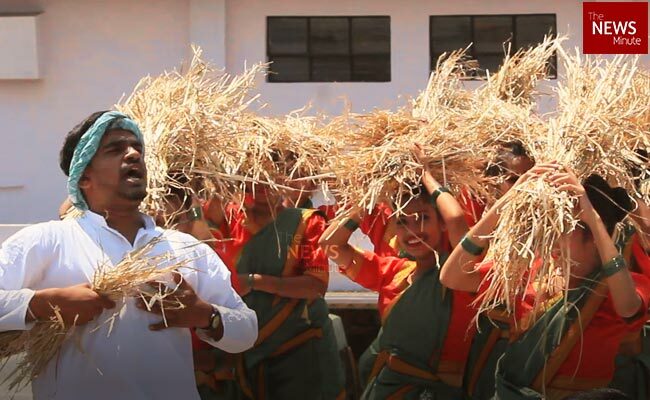 On another side was a troop of dancers from Bengaluru, dressed in green sarees and carrying a stack of hay on their heads, trying to match their moves to the tune of a song written especially for Kumaraswamy. The result? A bizarre dance sequence of JD(S) mascots with expressionless faces, waiting to be rid of the scorching sun. Speaking to TNM, Revathamma, a 29-year-old homemaker, said she was brought in from Ramanagara district along with several other women in her village. “The people said we had to go for Anithamma (Anitha Kumaraswamy). We don't know what is going on here,” said Ravathamma. Oddly, Revathamma was not the only one who was clueless when JD(S) party workers asked them to get into a truck and come all the way to Mandya. "They said we must shout ‘Nikhil, Nikhil’. They gave our husbands some alcohol as well. My husband, too, is here. I don't know what is happening here," said Asmathunnisa, a 31-year-old woman from Channapatna in Ramanagara district. When informed that it was an election rally, Asmathunnisa lamented how the JD(S) had reneged on its promises to the women in the state. 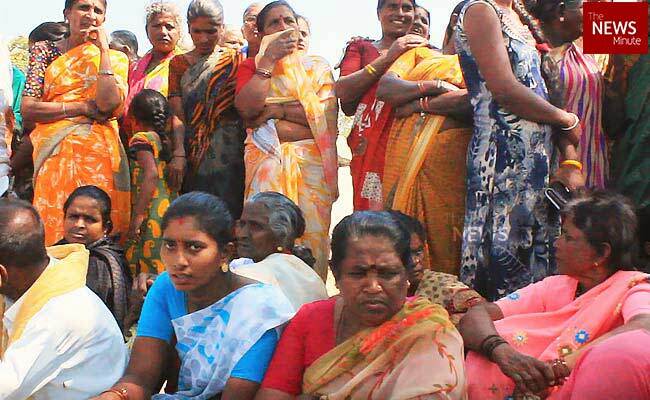 "When they came to ask for votes, Kumaraswamy told the women he would waive off the Stree Shakti loans. I had bought a tractor with the loan amount because I wanted to start cultivating crops. Not a single rupee has been waived. All the women voted for Kumaraswamy and JD(S) in Mandya because of this promise. If I had known it was an election rally, I would have stayed home," she explained. Are people of Mandya happy with Nikhil’s candidature? A little after 1.30 pm, Nikhil Gowda, flanked by his father and Karnataka CM Kumaraswamy, finally reached the temple. As Nikhil got into his caravan and began waving, thousands of people gathered around his vehicle and started cheering him on. However, amidst the blaring music and the pro-Nikhil slogans, along the side lines, were the people of Mandya, chorusing, "Sumalatha, Sumalatha, Sumalatha!" Nikhil Gowda will be fighting against Sumalatha, wife of late former Congress MLA and actor Ambareesh, in Mandya, who has a lot of ground support in the constituency. Sumalatha wanted a ticket from the Congress, but because the party had to defer to ally JD(S), she was unceremoniously left out, and decided to contest as an independent. The actor-turned-politician has the support of BJP as well as Congress cadre on the ground. Ravi Baliga, a resident of Malavalli, said that the JD(S) leaders had amassed a lot of support during the 2018 Assembly elections but have now disappointed the people of Mandya by indulging in dynasty politics and speaking ill of Sumalatha. “People in Mandya vote for sentiment. Almost every village has a fan club for Ambareesh. When Sumalatha came to our village first, she asked us if she should contest. She did not just come here and demand votes. She enquired about our problems. Nikhil Gowda, on the other hand, is just making promises without even considering what we want. They forced us to come here and we did. But we will support Sumalatha," Ravi told TNM. Forty-eight-year-old Rangaiah, a resident of Maddur, however, said that Nikhil might win from Mandya, but for a different reason. "If you turn off all the speakers, you can hear the silence and you can see why people are not happy to be here. But there are many in Mandya, who will support Nikhil simply because they owe allegiance to the JD(S). He has a chance of winning,” Rangaiah said. After celebrations at the temple, Nikhil finally reached the Deputy Commissioner's office and submitted his nomination. Water Resource Minister DK Shivakumar, too, arrived for his cameo performance and left after a few minutes of a photo op. 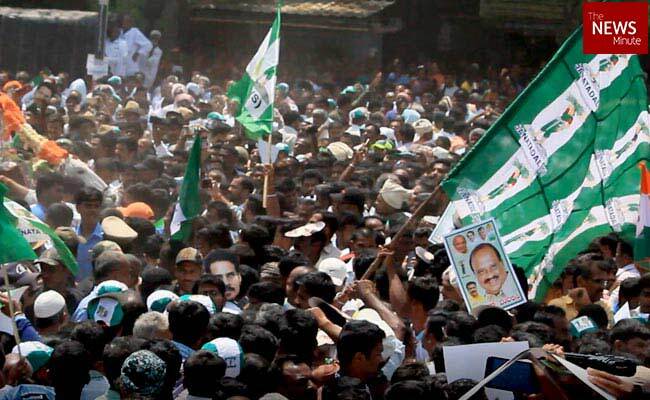 A few people watched Kumaraswamy and Nikhil Gowda addressing the gathering near the DC's office. 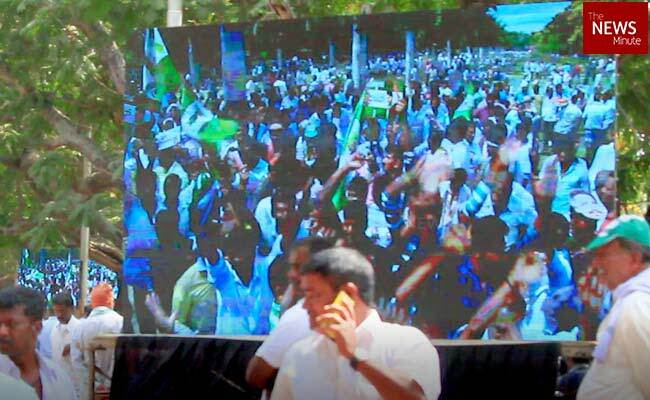 LED screens dotted the streets of Mandya, airing Kumarswamy's heartfelt speech. When passers-by caught sight of the screens, they stopped and stared. "There are so many JD(S) leaders here. Why did they have to bring in the grandson?” asked Chinnanamma, a 27-year-old resident of Krishnarajpet, a taluk in Mandya district. “People would have gladly voted for JD(S) if they did not only think about improving their family. They went back on their promise to us. We, women, are the worst affected,” she added. As Nikhil Gowda's vehicle left, a huge crowd of JD(S) workers gathered around it, waiting to catch a glimpse of the third-generation heir to the party. Minutes after his car drove away from the DC's office, the crowd dispersed. As Nikhil Gowda's nomination extravaganza had come to an end, bus stops were soon crowded, as people got ready to go back to their homes located in districts other than Mandya.